WESTOP provides its with members a variety of opportunities to network and develop professionally on an annual basis through chapter meetings, professional development seminars, conferences, and printed or electronic publications. Become a WESTOP Member today! Early Bird Registration is open now through October 8, 2018. 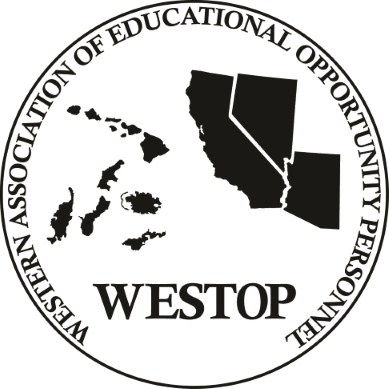 WESTOP is one of ten regional associations dedicated to furthering educational opportunities for low-income, first-generation, and students with disabilities. WESTOP's membership is comprised of educational equity personnel from the states of Arizona, California, Hawaii, Nevada and the Pacific Islands of American Samoa, Guam, the Federal States of Micronesia, the Republic of Palau, the Republic of the Marshall Islands and the Common Wealth of the Northern Marianas. WESTOP has had a trailblazing legacy of strength, leadership and commitment to represent the concerns and needs of TRIO students and educational equity issues in our region. We continue to face numerous challenges: the uncertainty of receiving substantial funding; delays in grant competitions; many campuses and states that are coping with unprecedented budget shortfalls which have resulted in work furloughs; and implementing the new HEOA regulations. As in the past, we have managed to come together and advocate for educational access on behalf of our students. It is vital for WESTOP to strengthen its advocacy partnerships and educational alliances regionally and nationally to get through these challenging times. To create and develop educational professionals who are able to advocate and provide educational opportunities for those who are under-served.